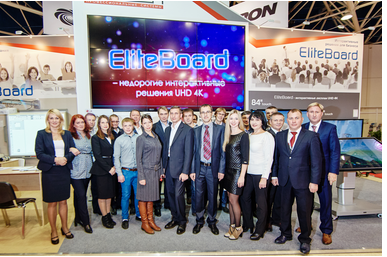 Elittech, LLC is a leading Russian distributor of professional video equipment and TVs of a premium segment with a wide partnership net in all the regions of the country. The company was created in 2007. Elittech was included by Astera business channel into Top 20 “The best Russian distributors 2016”. Audio, video and interactive equipment of more than 30 brands such as Panasonic, LG, Samsung, Sharp, SONY, Philips, Bang&Olufsen, NEC, ViewSonic, Unilumin, AOTO, Sennheiser, Optoma, Yamaha, Seada, VISIOBOX, Spinetiх, Kramer, Crestron and many others are always in stock of our company. Our own personal demo-room of professional video equipment with a permanent equipment exposition such as: video walls with 1,8 mm bezel, commercial TV, OLED, LCD TV, interactive equipment, LED screens, projectors, controllers and many others. Training center for seminars with a capacity of 30 people, where trainings about exclusive products, presentations of new products are held on regular basis. Main warehouse located in Moscow – 2000 square m with a comfortable routes from Moscow Ring Road, where more than 4000 product items are always in stock. Company provides it’s clients with a free delivery with an option of delivery at the same day of order. Principles of working with clients: operational efficiency, high quality equipment, professional tasks implementation, expense minimization, creating comfortable conditions for dealers and achieving client’s goals. Online shops at a federal level – OZON, TECHPORT, HOLODILNIK, KOMUS, NIX and others. More than 120 AV salons and retailers in Moscow and regions. By working together with partners Elittech had realized AV purveyance for more than 500 projects from 2009 in various branches of business and economy. ООО "Элиттех - профессиональные системы"
LLC "Elittech - professional systems"